Tibetan Sho Dun Festival is also known as “Yoghurt Festival”. In Tibetan, “Sho” means yoghurt and “Dun” means eating. So the festival literally means eating yoghurt. It is usually held in the middle of August, from the 15th to the 24th of the fifth month. Besides, it is definitely one of the most popular festivals in Tibet. what’s more, it begins in the 16th century when pilgrims served yoghurt to the monks who had been doing their summer retreat so hard. The prelude of the festival is unveiling Thangka in Drepung Monastery. 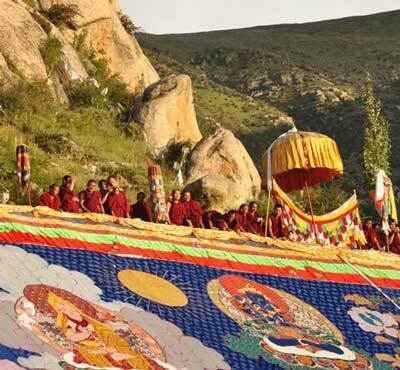 At about 8 am, the Drepung Monastery will present a large-scale Thangka portraying Qamba Buddha on the mountain behind. Meanwhile, large numbers of people come to witness the spectacular moment. After seeing Thangka, people gather in Norbulingka, which was once the summer palace for Dalai Lama, eating yoghurt and watching Tibetan operas performed by professional troupes. Moreover, in the 17th century, the 5th Dalai Lama introduced Tibetan opera into celebration. So, this Tibetan Shoton festival is also known as Tibetan Opera Festival. There are also horse and yak racing performances there. In sum, Buddha display, Tibetan opera shows and horse and yak racing shows are three main activities of Shoton Festival. It is the best time for travelers to explore and discover more about Tibetan’s local religion, culture and tradition.